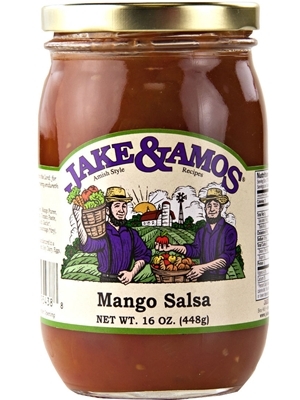 Jake and Amos Mango Salsa is spicy with a hint of sweet mango flavor that is sure to make it one of your new family favorites! Use this salsa with classic tortilla chips or use it as an ingredient in your next soft or hard shelled taco. Make a tasty side salad by serving this salsa on top of fresh salads greens or try it on top of baked or grilled chicken. Ingredients: Tomatoes, Mango Puree, Mango, Sugar, Onions, Tomato Paste, Vinegar, Salt, Citric Acid, Garlic*, Jalapeno Pepper*, Seasonings (*dry).